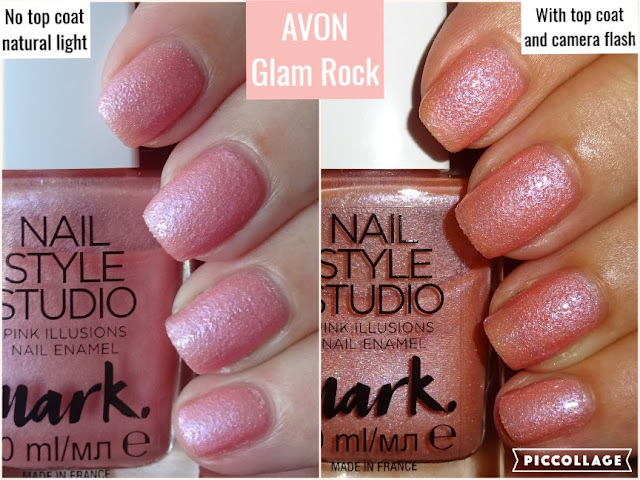 The Pink Illusions Collection, from the Avon Mark Nail Style Studio range, launches in the UK in C16. A selection of 5 pretty pink nail enamels priced £3 each. 'Pretty In Pink' from the collection is included in the Avon Breast Cancer Crusade with £1.50 of each sale going towards CoppaFeel. Today I'm reviewing Glam Rock. Glam Rock is a peachy pink textured polish with an iridescent hue. When applied to my nails the wet polish is smooth, as it dries down it becomes matte and the texture is apparent. You can change it up and give it a glossy appearance by adding a couple of layers of top coat to smooth it out and bring out the iridescent shimmer. See below with top coat and camera flash. I found that as Glam Rock is a textured nail enamel it can take longer to remove than regular nail enamel so be prepared to take your time when removing it or apply a peel off base coat. The Mark Nail Style Studio nail enamel range comes in the standard Mark bottles, 10ml, 5-Free (free of: Formaldehyde, toluene, DBP, formaldehyde resin, and camphor).